P. S. My awesome top is by Tracy Reese--her clothes are phenomenal!!! 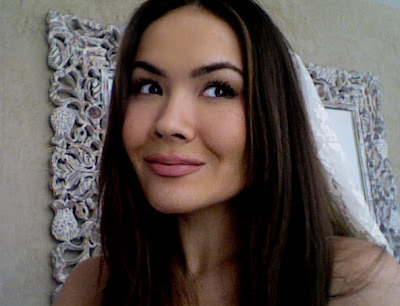 Today, I'm fulfilling a long awaited request from my bestie Larry aka Larissa, for a Bridal Makeup Look. This bride-to-be knows that I'm no expert at weddings, (nor do I claim to be) but she asked me to do a look that showcases what I think a "bride should look like". I searched the net for inspiration for about 5 minutes and decided to give up because the only inspiring wedding makeup I found was Bollywood makeup. Yes, I am biased. I love bold, bright colors and I tend to favor exotic definitions of female beauty... hence, I will never have a white wedding. On the other hand, Larry the traditionalist, will not be arriving on an elephant, so I'm going to present her with a couple of looks worthy of a classic modern bride. I hope you all enjoy them as well. This post will be a review of my maquillage throughout the week, in hopes to catchup and get back on track to my regular posting routine. yaaayyy!!! Samedi has arrived and I'm sure a lot of you will be celebrating Valentine's Day today :)) Hope you and your sweetheart are having a wonderful Saturday so far and I'm delighted to be a part of it ((: if you're reading my blog, that is :))) Today's post is straight to the point: I'm showcasing some of my archived makeup looks that I find to be appropriate for a Valentine's Day celebration. I tried to select different styles of looks, so that it can accommodate a bunch of different tastes. Hope you all enjoy!!! Happy Friday and Happy Bornday to GiGi!!! So many holidays and birthdays this month--it is an overwhelming and exciting time of the year :)) Let's see, what's in store today...? My poll has closed and the winner of the most feared makeup trend is ::drumroll::..... Red Eyeshadow, of course. I fear it too, but I'm looking forward to experimenting and exploring the bloody trend, (said in my best British accent ;) so be on the lookout for the Red Eye post coming up very soon. 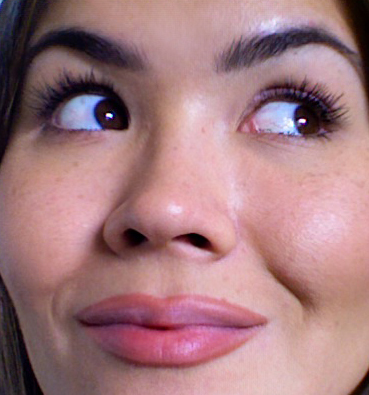 A lot of you have also been asking me to do a how-to on lashes, and since my Lashtite semi-permanent glue and remover (for individual lashes/extensions) have just arrived in my mailbox, I'll have that tutorial coming up asap. 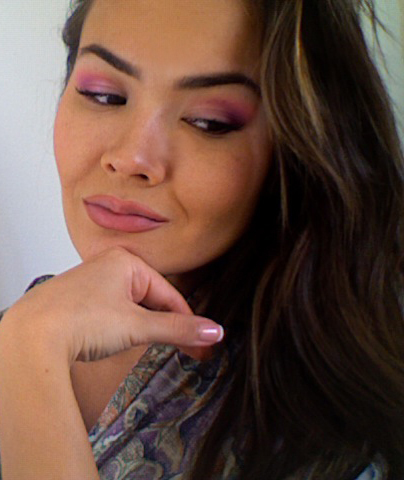 For now, you can go to my Lady Vengeance post, scroll down to the bottom and read about the application of strip lashes (non-permanent falsies). I'll also have a bridal makeup tutorial for all you brides-to-be, and I'll try to fulfill some earlier celebrity requests, so don't forget to check back!! Today's post will launch the countdown to V-Day... and I'll start it off short and sweet. 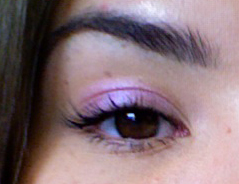 Valentine's Day makeup can be as dramatic or natural as you like, but the key is keeping it romantic and feminine. This look will be perfect for the daytime, just to commemorate the holiday while you're at the office or perhaps on your day off with your significant other. Hope you enjoy!! P. S. It's V-Day for Egypt!!! Happy Thursday indeed!!! The last couple of days have been really quite great (for me), even though the bone chilling weather has returned to claim its casualties. I've been dressing warm, keeping it cozy in cashmere and chic in Uniqlo heat-tech. In the winter, layering is unavoidable, so make sure you take advantage of this weather and layer away! I like to pair men's "wifebeater" tanks (what a name...) with long cashmere cardigans and long sleeved cotton tees with bulky knits and vests. For every day, I like to wear my bright Russian shawl over a bland outfit to spice it up and also to show some solidarity ;)... I wrap the shawl around my neck, like a huge scarf for a Mary-Kate hippie effect. Finishing your outfit with a chunky scarf or a bright shawl will add another dimension to your layering, so don't be afraid to show your individuality. 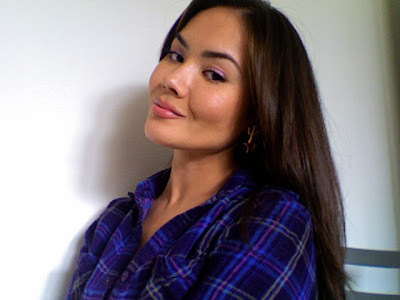 Today, I'm going to show you guys how a little bit of makeup can make you look and feel instantly better, while taking virtually no time or hassle in applying it. I call it my 5-minute Perk Me Up makeup routine. Start with a clean and moisturized face. Apply mineral foundation using a kabuki brush all over your face, concentrating on areas that need covering--blemishes, dark spots, etc. Brush your brows in place and apply some eyebrow gel or wax to set them, if you need to (I need to). Take a peachy blush and apply to the apples of your cheeks. 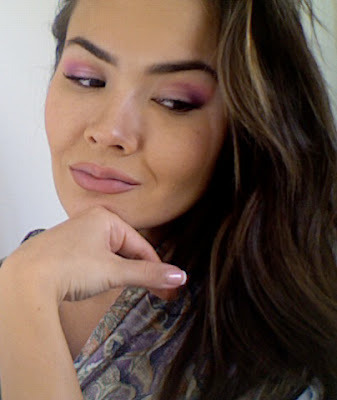 Take a flat brush and a shimmery lavender eyeshadow (a universal brightener for all eye colors) and pack it all over your lid, slightly past the crease. 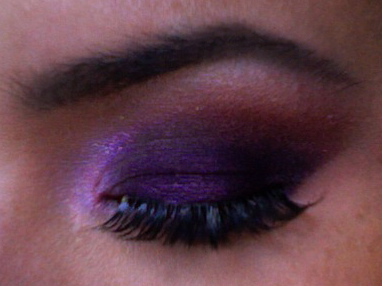 I used Grifter from the Urban Decay Ammo Palette . Curl your lashes, brush them with a spoolie, and apply two coats of mascara. Tip: Place your mascara wand at the root of your lashes and wiggle it outwards (towards your temples) instead of straight up. This technique will make your eyes look bigger because the outer corners will be more lifted. Coat the bottom lashes once, this will make your eyes seem more doll like and awake. A fellow blogger pointed out that I don't always need to line my lips and it made me realize that I almost never leave my lips or eyes without liner. It's like my security blanket... I feel naked and cold without it lol!! Well, she was right. We tend to forget that makeup hides our true features, sometimes wrongfully covering up something that is actually beautiful about us. So what, if my eyes aren't big enough or blue enough and my lips aren't full enough or red enough and my skin isn't blemish free or light enough or dark enough... so what!! On a regular day, we all need a reminder or a pick me up... We've all got insecurities or things we don't like about ourselves. Remember, makeup is not the answer to a low self-esteem. It's merely a temporary solution that won't fix your problems in the long run. I'm no spiritual guru, but you gotta start from within... heal your core = heal yourself. Why do we hate the things that most people like about us? 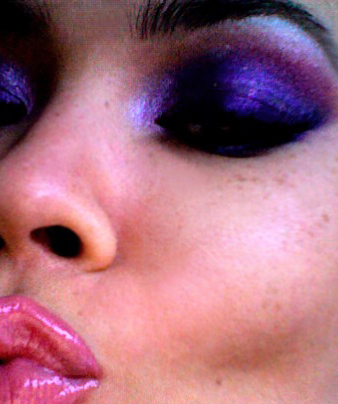 My freckles... they come out more in the summertime, and I love them, now. THE CONCEPT: A couple years ago, I saw The Vengeance Trilogy , a South Korean movie trilogy about revenge, which blew my mind and just knocked my socks off!!! I believe it was based off a Japanese manga of the same name... Korean or Japanese, it was awesomely mind-boggling and refreshingly twisted. So, if you're into twisted foreign films, watch the second installment titled Oldboy , and you will not be disappointed. Anyway, I got my vengeance idea from this film and the Japanese manga--it's like ninja meets anime :/ I like to base my makeup looks on concepts or stories and sorta build from there... I thought it was fitting because after looking and feeling like crap for an entire week of imprisonment by the evil cold, I decided to break the chains and kiss my cold bye bye. Now, I'm back and I'm better than ever and I wish to take pleasure in avenging my cold mwa-ha-ha. Hope you like the concept, I kinda do. TOOLS YOU'LL NEED: Here's everything that I used for my entire face. Click to enlarge. 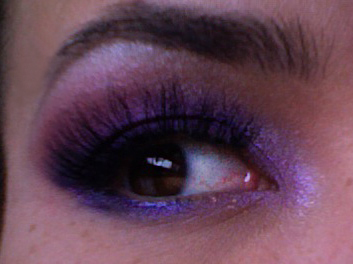 MAC pigment: Grape (purple with hot pink glitter). I used it for the lid color. 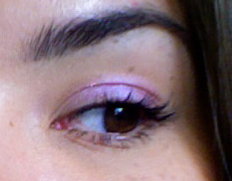 Lashes: Ardell Whispies ; Glue: Duo dark tone adhesive . Brushes: Medium Shadow brush for application and Stiff Crease brush for the crease and blending. I don't remember the brand, but I'm sure I got them both at Target. Bare Minerals matte foundation in Golden Medium and my pink Kabuki brush from Coastal Scents. Because I'm not using a lot of products on my face, I want to even out my complexion first. 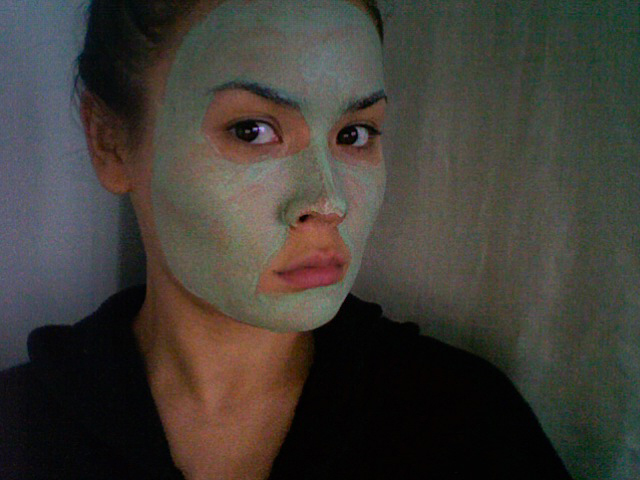 I'm starting my routine with my Queen Helene Mint Julep Mask . For more skin care tips, go to my post The Skinny About Skin. TO ACHIEVE THE LOOK: I kept my face super simple, one because I really wasn't going anywhere and two, because I wanted to keep the focus strictly on the eyes. I used my Bare Minerals matte foundation in Golden Medium over the t-zone only and to cover up any blemishes. 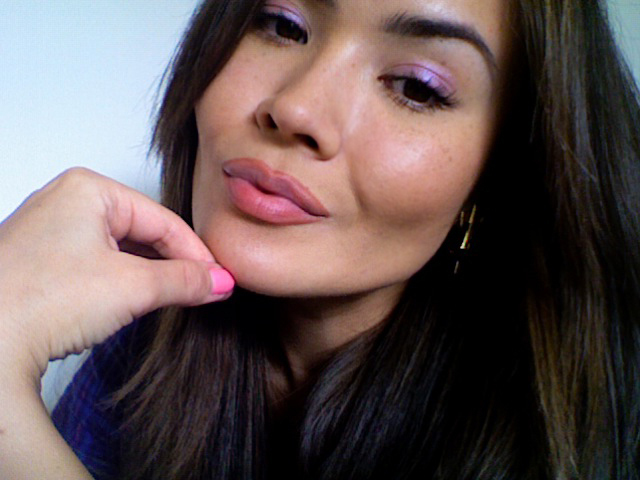 For the lips, I used NYX lipliner in Natural and NYX gloss in Mauve. 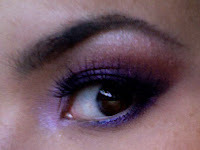 Taking a purple pigment (MAC pigment in Grape) with a flat eyeshadow brush, begin by packing it on the lid, going past your crease. Keep the shape parallel to the line of your crease. With the tip of the brush, also line underneath your bottom lash line. I like using pigments (loose shadow) because the effect is very opaque. Keep a tissue handy to catch fallout. 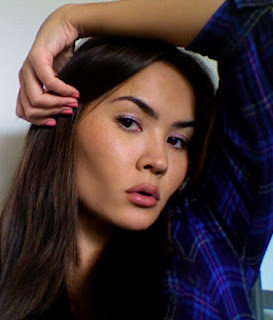 With a stiff dome-shaped brush, apply a burgundy color onto the crease, blending with the purple. Concentrate most of the color on the outer portion of the eye. Wipe off the flat brush and apply a white shimmery shadow under the brow and a lavender shimmery shadow to the inner corner. 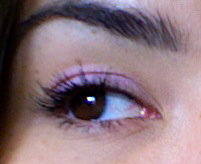 The lashes that I'm using are strip lashes, so they're far from natural looking. I think they're fun and demure and add an extra degree of drama to the eye, but I'd never claim they were mine lol. If you're looking for something believable yet enhancing, go for half lashes , or lash accents . They're easier to put on and they blend in nicely with your own lashes. I use Duo dark tone glue for strip lashes because it's the only one that dries quickly and does not pull out any of your real lashes when you take them off. Remove the lash from the tray using tweezers. Wait 30 seconds for the glue to get tacky. While you wait, bend the lash gently to form better to the shape of the eye. With dull tweezers, take the lash by the center and place to the center of your lash roots. Once you practice a couple of times, you can apply your lashes with your fingers. Take the outer corner and place it to outer corner of your eye, then the inner corner, respectively. The inner corner of the lash strip does not have to meet your tear duct, it can stop where ever it stops, as long as the outer corner is at the very corner of your your eye. Flick the lashes up or gently crimp them with an eyelash curler. Take a black mascara and run it just underneath the roots of your lashes to blend your real lashes with the fake ones. To remove: Grab the outer corner and gently peel off. Voila!!! These eyes never tell a lie... I'm so in character! !